Get rid of the flood - it's already a common site to see parts of Manila being soaked in floodwater after a typhoon or a series of heavy rains. 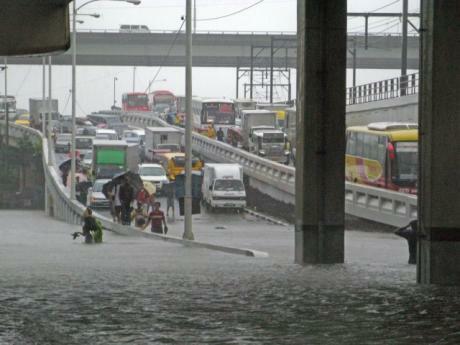 Flood is not just inconvenient and hazardous but it causes a hell lot of heavy traffic. If the authority will be able to clean up the roads, educate the people, come up with harsher punishments for improper garbage disposal, improve the floodgates (whatever they call it) then Manila will have less wet dreams and congested traffic during the waterworld season. If we can't get rid of the flooding, i suggest we start building arks. 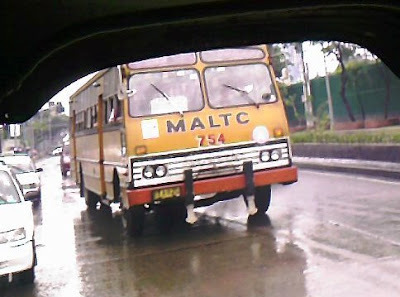 Discipline the Drivers - *I think this one is more appropriate for the LTO rather than the MMDA. As told by my friend who recently took her driver's license, she said that "lagay system" is still very prevalent in the LTO office. It's the age-old system where applicants pay a certain fee to "fixers" so that they no longer need to undergo the long lines, exams and slow processing. I guess people would rather exchange a few hours of comfort for a life-long burden caused by undisciplined drivers with little or no actual road knowledge that even a simple "no loading' or "no U-turn" sign proves to be impossible to follow. Ansaveh?? LTO Fixers even have the guts to create an online account to advertise their services. The nerve. Retire old vehicles - As far as i know, this is already being deliberated upon. They will be imposing a limited number of years to operate Public Utility Vehicles. I remember our Kapitbahay saying that japan has very light traffic because they have this policy of retiring vehicles after a certain period. And where do they throw it? To us of course! Well some of it maybe, remember when you see Japanese writings and signage on old buses along edsa? yup, those were the ones. 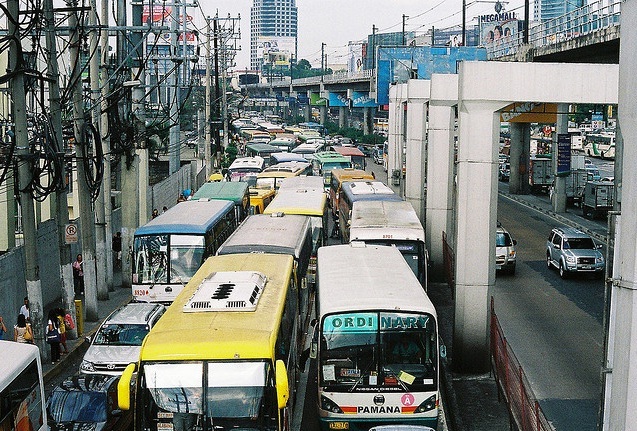 Transfer provincial Bus terminals elsewhere- there are numerous bus terminals located along EDSA. They don't just delay everybody else whenever they go in and out but most of the time they also transform EDSA into an extension of their terminals and parking spaces. 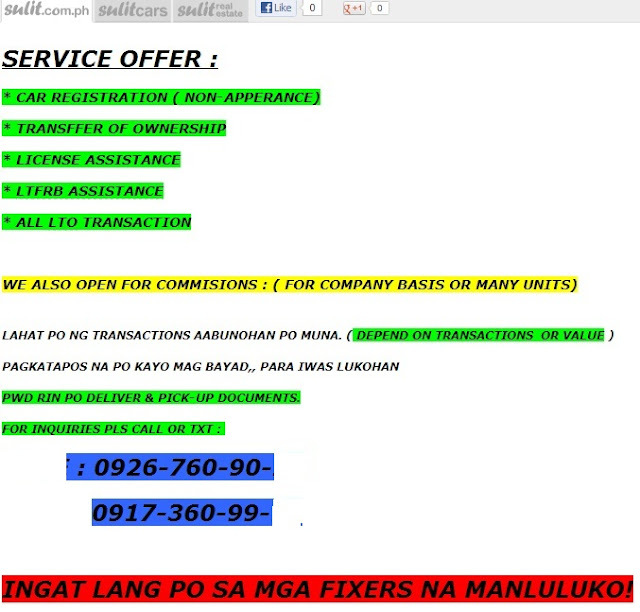 Cancel franchises of bus companies involved in serious accidents - *Wattup LTFRB. They're undisciplined and reckless. 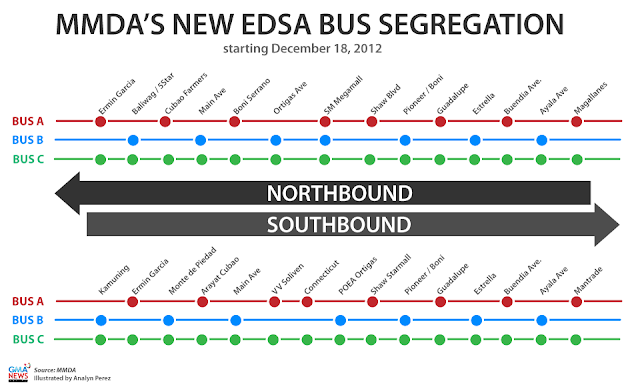 Getting rid of them means getting rid of a good number of excess vehicles in EDSA plus preventing future accidents. Cancel the franchise and make it permanent. Saying that EDSA is hopeless is now only an exaggeration and plain negative thinking. Although the traffic situation is not a 100 percent resolved, we can definitely see a huge improvement all thanks to Chairman Tolentino and the rest of MMDA. Since Tolentino took the position of chairman, the MMDA has been implementing a lot of new road rules that although some motorists think of it as additional burden, these changes definitely have some positive long-term effects on traffic. 2) Bus Segregation Scheme - probably my favorite, this is where buses are now classified as either A, B or C and each with corresponding bus stops. This means less buses hanging around a certain stop and shorter travel time for buses with less stops. Well this only goes to show there is nothing but a brighter future for EDSA and hopefully the rest of Metro Manila in the near future.